Welcome to the May edition of the All Vampire Book and a Movie Club! 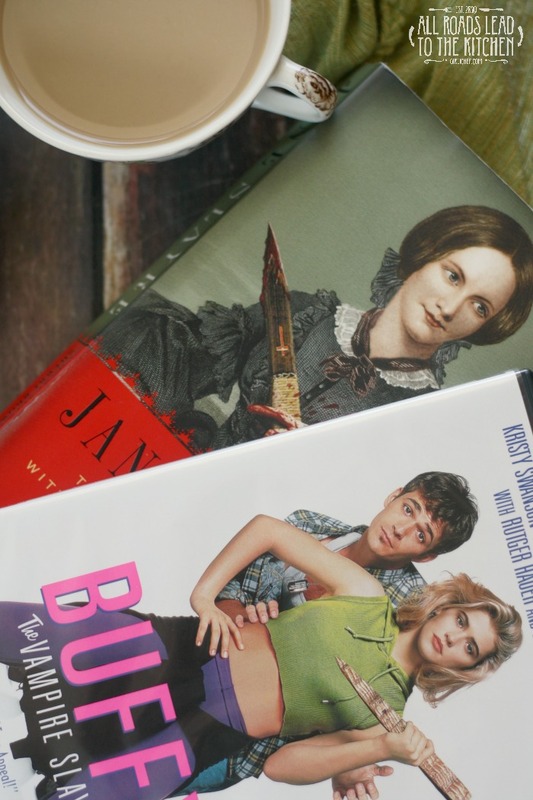 Our host Kimberly from Coffee and Casseroles chose two great offerings this month that differ from previous months in that the movie is not an adaptation of, or based on, the book. Instead, there's a common theme that ties them together—both have a female fulfilling her destiny of being a slayer as the main character. The chosen book being Jane Slayre, a reimagining of Charlotte Brontë's Jane Ayre by Sherri Browning Erwin. The chosen movie was the flick that led to the popular tv series, Buffy the Vampire Slayer. Set in modern-day (modern for 1992) Southern California, Buffy (Kristy Swanson) is a seemingly shallow teenage cheerleader whose biggest worry is whether an outfit is currently in style. But at night, she dreams of past lives in which she hunts and kills vampires. As her peers begin to go missing and show up later, changed into vampires, her small world is opened up when she meets a strange man named Merrick (Donald Sutherland) who informs her of her birthright...her destiny. "Don't you get it? I don't want to be the chosen one. I don't want to spend the rest of my life chasing after vampires. All I want to do is graduate from high school, go to Europe, marry Christian Slater, and die! 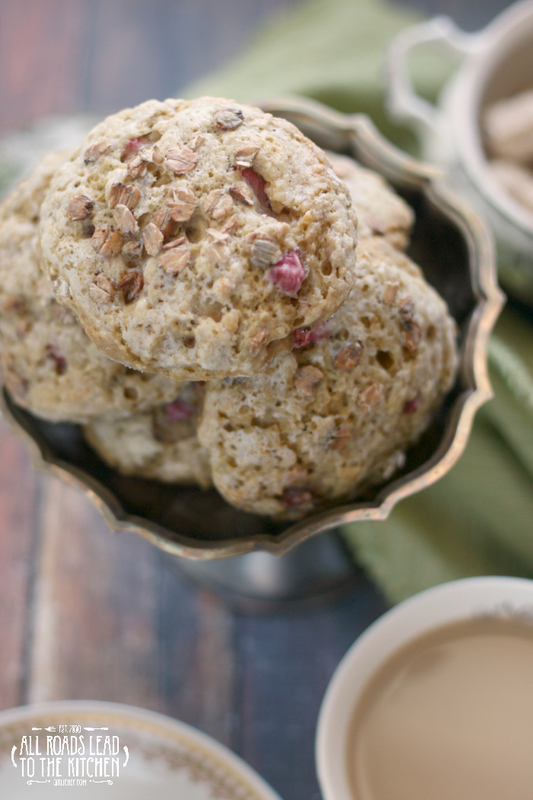 Now, it may not sound exactly glamorous to a sconehead like you, but I think it's swell." She eventually embraces her destiny, teaming up with Merrick and Pike (Luke Perry) to rid Los Angeles of the teenage vampires and the vampire king (Rutger Hauer) and his henchman, Amilyn (Paul Reubens aka the best character in the movie). Yeah, it really is that simple. It's not a "thinker", but it is fun and reminds me of being in high school since I was a high schooler when it was first released. As far as food goes, we see licorice, soda, popcorn, a sucker (Blow Pop, I think), booze in a flask, coffee, hotdog, sparkling water, tea, punch, Pepsi, pig, and Blueberry Schnapps. Oh, and the fact that there were so many stakes made me crave a juicy one—steak that is. There's also the moment after Buff's first "solo" kill after her training when she exclaims "Toaster caked him!". Okay, I loved this reinterpretation of Jane Ayre. But that's really no surprise to many since I tend to love this kind of book; a literary classic with fantasy elements woven seamlessly into the story. I also loved the books Abraham Lincoln Vampire Hunter and Pride and Prejudice and Zombies. The setting is Northern England, in the mid-1800's. We're introduced to young Jane (orphaned as a baby) as she's trying to survive living with the Reed family of vampires, related on her mother's side. Her uncle was the only kind one among them, and after his death, she is forced to follow the cruel family's schedule—sleeping by day, hunting and eating by night. One night she gets a visit from the ghost of her uncle, telling her that she must fulfill her destiny—to slay. "It's in your Slayre blood." He urges her to seek out her kindred spirits, the Slayre's that are still living...to find them and study with them. You probably know the story of Jane Ayre, and well, it's told expertly with the addition of vampires, ghouls, zombies, and werewolves, and ghosts, so I won't bore you by recapping it all. I'll just tell you that Jane always had an inkling when supernatural creatures were around. The hair on her arms would stand up and she instinctively knew how to dispatch of them. She did eventually find her Slayre kin and worked hard to train and hone the skills she had naturally and the ones she'd picked up over the years. Most of the food mentioned is humble, if not meager. There was bread, cheese, cakes, tea, mutton pie, hot roast potatoes, spinach, (burnt) porridge, oaten cake, buns, cheesecake, tart, berries, gruel, whiskey and mead. And of course there were plenty of stakes, along with one mention of actual steak, in this story. I took elements from the book and the movie and brought them together to make my inspired-by recipe this month. While Los Angeles in the 1990's and England in the 1880's probably don't have a heck of a lot in common, my Buffy inspiration comes from that quote I shared earlier. 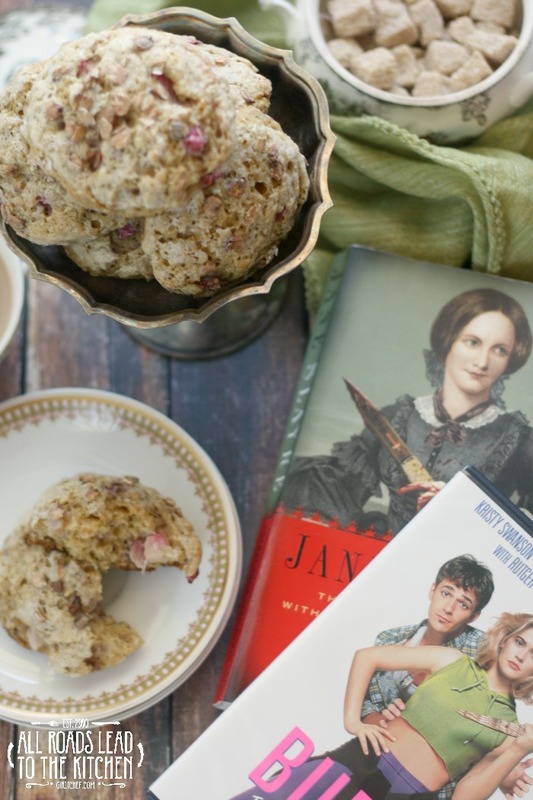 Buffy called Merrick a "sconehead", and well, scones are pretty British (and were even in Queen Victoria's time), so I thought that would be a fun way to tie the book and the movie together. I pulled inspiration from Jane Slayre for the type of scones I made. There's a moment when Jane is about to collapse from hunger when she asks a farmer that she spies through the open door of his farmhouse if he would give her a piece of his bread. I also added some fresh strawberries for bursts of color and sweetness, since they were mentioned on page 239. "One midsummer eve, Adele, weary with gathering wild strawberries in Hay Lane half the day, had gone to bed with the sun." So now, these two women are tied together not only by their similar vampire slaying destiny, but also by a recipe for scones. 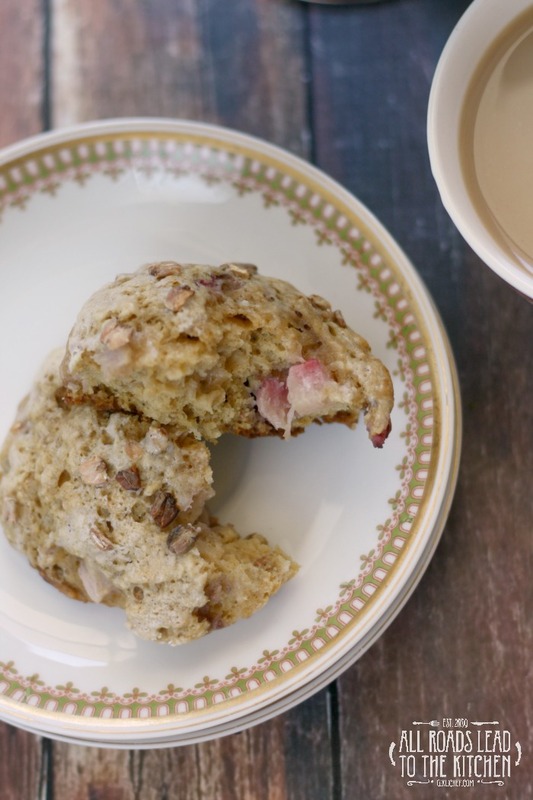 I made these with my normal method for scones, but added malted barley flakes, baking soda, and molasses to mimic the flavor and texture of brown bread. And guess what? They really do taste like brown bread...but also like scones. A delicious and intriguing combination, if you ask me. 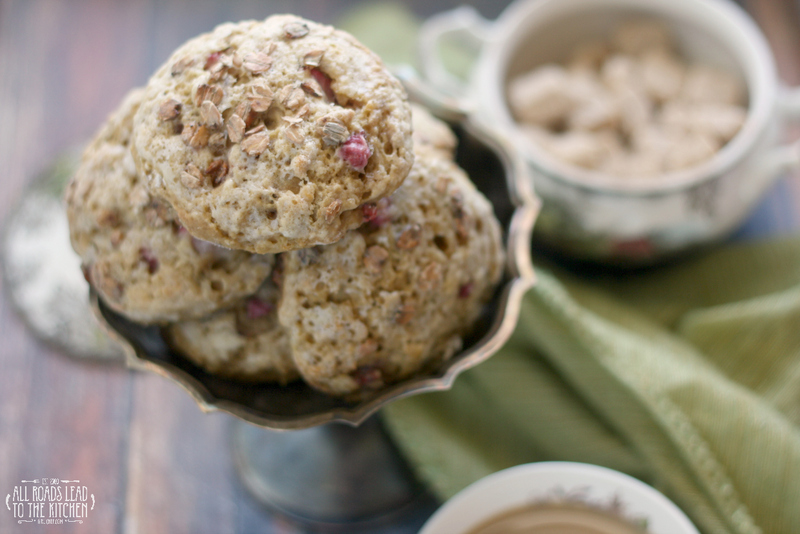 Scones infused with the flavor and texture of brown bread with some sweet bits of fresh strawberry. Whisk together flour, malted barley flakes, baking soda and powder, and salt in a large bowl. Using your hands, rub the butter into the flour mixture, squeezing and pinching until the mixture resembles a coarse meal with chunks no bigger than the size of a pea. Whisk in the strawberries and sugar. Pour the 1/2 cup of buttermilk, molasses, and egg in a small dish and beat with a fork. Pour this into the flour mixture and combine gently. The dough will look pretty dry and shaggy. Turn out onto work surface dusted with just enough flour to keep dough from sticking and quickly pull the dough together into a rough mass. Press and knead until it just comes together. To keep the scones tender, try to do this in as few kneads as possible...preferably no more than 12. Pat into a 1/2-inch thick slab. Use a 2-inch round biscuit cutter to cut 12 rounds of dough, gently patting dough back into a mass as necessary. Place at least 1-inch apart on a baking sheet that has been lined with parchment paper. 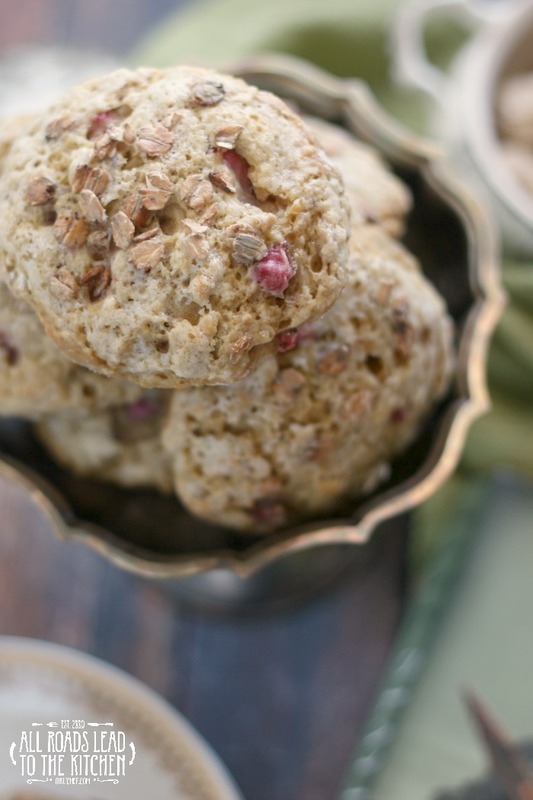 Pour a splash of buttermilk in a bowl and lightly brush the top of the scones, then sprinkle with a dusting of sugar and a few extra malted barley flakes. Slide into preheated oven and bake for 12 minutes, until golden and cooked through. Transfer to a wire rack to cool slightly before serving. This month's assignment was Jane Slayre (book) and Buffy the Vampire Slayer (movie). 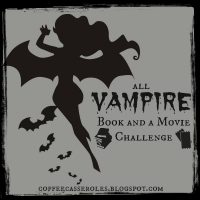 If you'd like to join the discussion next month, we'll be both reading and watching Interview with the Vampire, and our posting date will be Sunday, June 26.